Today we were up a bit earlier, probably to make sure we got a shower with hot water. The Chef intended to wash both of our towels this morning and hang them over our folding chairs outside, but by the time we'd both added a few extra items it became necessary for me to put the washing line up. Whilst she did that, I emptied the loo and did a couple of maintenance jobs. Tomorrow I have to attempt a miracle and repair the plastic catch which holds the habitation door open in the event of the wind blowing it closed. I have already replaced it once, and, based on the theory that if it can break once, it can break twice, and now has, luckily I carry a spare. But we are too early in to the trip for me to fit it, because that one could also break just as easily. The plan tomorrow is to marry up the pieces and not only try to join them with epoxy resin, but also provide it with some splintage and support from behind, again using the resin. Why on earth they make such things from plastic is beyond me. Once we return home I shall pick the brains of a former colleague, responsible for the servicing of A&E ambulances, to see if he can recommend a door catch made of steel, and which will fit in the space provided. 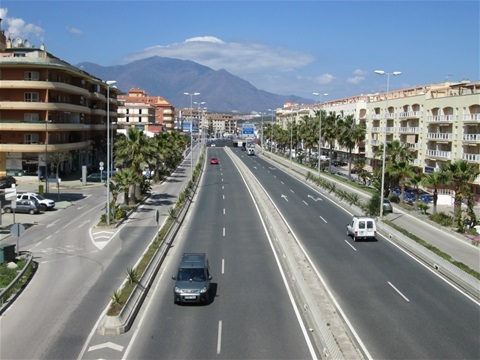 Once we were ready it was another wander down to the town, San Luis de Sabinillas, passing through the small fishing village next door and the marina complex, Puerto de la Duquesa. Quite a hike, but then we have nothing else to occupy our time. It's hard to believe that we spent the whole month of January 2015 at this campsite and in all that time we only had a day out to Gibraltar on the local bus service, a day out to Estepona in the opposite direction and a long walk up the hill to the village of Manilva. It was even windier today with the waves crashing against the beach just that bit more angrily. Passing bars and restaurants along the way we had to sympathise with poor Brit Easter holiday makers who were having to keep wrapped up against the wind whilst sitting having a meal or drink. Just as Benidorm seemed to be filled with Northerners, here they all seem to be from Southern England. I must assume that there are still flights from places like Norwich Airport in to Gibraltar which would make it a far more convenient destination. We just wanted a bit of shopping from the Macadona supermarket in town. Now is it just me? I get infuriated when I see horrid kids climbing in to the shopping trolleys being pushed by a parent. Given the high level of dog s**t and its residue on the paths in Spain there's every chance a kid could have traces of it on their shoes. So in they climb and tread it all over the steel mesh on the bottom of the trolley. They do it back home as well, I've seen kids fall out of them, tipping the trolley over at the same time. I never go to their aid, serves them right the little sods. I don't know why supermarkets don't just ban the filthy, unhygenic and unsafe practise. After the shopping it was the long hike back, stopping off in the village next door to check out access to a piece of wasteland which we fancy parking on for twenty-four hours on Monday, before heading down to La Linea on the Spanish side of the border with Gibraltar, in the hope we can get a parking spot on the marina complex where we'll grudgingly have to hide until after Easter. The festivities commence next week for their 'Semana Santa', which I believe is Spanish for 'Yet another good excuse not to go to work'. Here on the Costa's we get a free weekly paper if we can find somewhere with a pile on the counter. The campsite here had last week's edition when we arrived and the new edition the following day. Below are two quotes from it. 'Due to the fact that not enough people are dying quickly enough, the NHS and Pension Department are continuing to experience financial difficulty which has resulted in two reports suggesting that the retirement age will have to be increased again'. So there you are .... die quicker!! 'A man received a three-month suspended prison sentence after he was caught sexually assaulting one of his chickens in Normandy. His wife and daughter caught him in a compromising position with his trousers down'. Now you don't get to read stories like that in the Daily Telegraph. The weather back home has been as sunny and warm as it has been here today. Such nice weather is well earned as it's been a very long winter back home this year. The few pictures I shall attach today will be of the town, San Luis de Sabinillas.